Shopping for a few fun ideas for Mom this year? 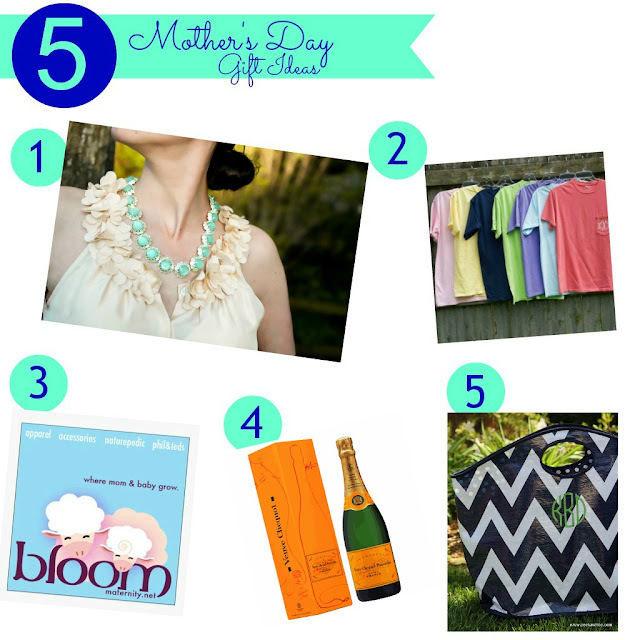 Take a look at five of my favorite picks for that special woman in your life! Whether she's expecting, just welcomed her first baby or even her third, there's something for every mom! I have had the privilege of working with most of the business owners you see listed above and I can guarantee that not only will Mom love any one of these gifts but the women behind these businesses are wonderful, passionate and dedicated mothers themselves. There may even be a discount code (or two!) that you can use so please check them out! 1. The Reagan Necklace from Bridier Baubles: A beautiful and affordable lookalike to a very popular and expensive version, this necklace would make a great addition to any mother's Spring and Summer wardrobe! It's also available in blue and yellow. You can purchase this necklace here for $35.00. 2. A Monogram Pocket T from Lil Sweetie Designs: Everything is made sweeter with a monogram! Mom could easily pair this t-shirt with a pair of shorts for chasing after the kidlets or dress up a pair of black yoga pants while out running errands! You can purchase this t-shirt here for $23.00. Use code "ilymtc20" to receive an additional 20% off! 3. A gift card from mom and baby maternity boutique Bloom Maternity: Shopping for an expectant mother or a new mom? She could certainly use a gift card to one of my favorite online maternity and baby boutiques! Whether she decides to put it towards a new diaper bag, a padded car seat carrier or even a new maternity dress or nursing tank top, the possibilities are endless! You can purchase a gift card to Bloom here. If you happen to stumble across something else she might like, use code "carrots" for 10% off your purchase! 4. Bottomless Champagne: Okay, maybe I'm the only mother who has this on her Mother's Day wishlist. Sleeping in late, cuddles with my boys followed by breakfast in bed, a jaunt at the local spa for a massage and a day full of bottomless champagne sounds right up my alley. 5. A Mixed Bag tote from Peekawhoo Boutique: Who needs paper or plastic when you have these alternative stylish and durable options? Whether Mom is off to the market, the pool or the beach, this tote would make a great catch-all for all her favorite things! It can even be used for storage in the playroom or laundry room. And like I said earlier, you can sweeten it up with a monogram for no added cost! You can purchase a Mixed Bag here for anywhere from $16-$24.